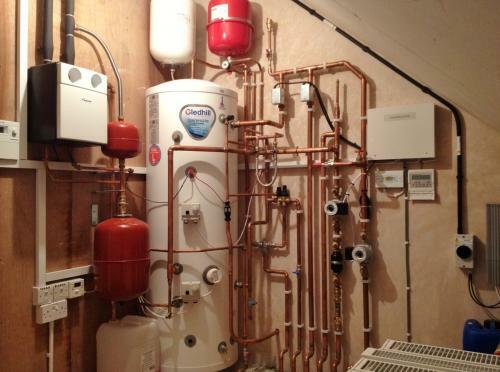 Some photos of boiler and hot water cylinder installations we have completed. This is a twin coil heat pump unvented hot water cylinder we installed. Perfect for integrating different renewable technologies. We installed Solar Photovoltaic (PV), Solar Thermal and an Air Source Heat Pump at this property. The water in the cylinder is heated by an air source heat pump located in the garden and by solar thermal panels on the roof. The heating system is heated by the air source heat pump, with the solar pv panels helping towards the electricity consumption. The old oil boiler and oil tank were sent to the scrap yard!!! !